Yes my style mavens, I have jumped on the flared denim bandwagon. Well, I must be honest- I have jumped on the anything flared bandwagon. I blame this new infatuation on that pesky case of fashion ADD that I frequently reference. Plus, the new rise in nuevo 70’s has made the made the options for bell bottom- inspired silhouette easier to obtain, and also appreciate. Flares look SO good on you though – so keep rocking them. You are rocking the flared jeans, love how simple and chic this is! Makes me want to run to Express to pick up a pair. Oh I ADORE your look – it’s pretty much perfect. 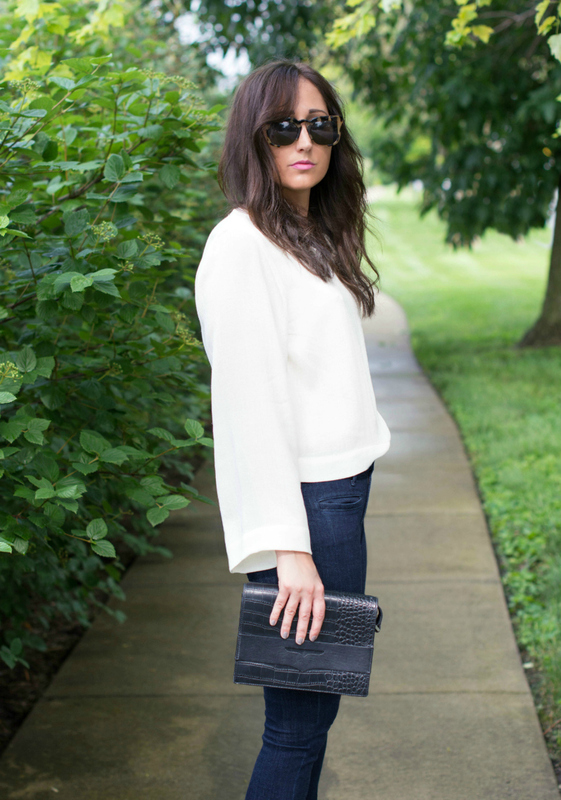 The bell sleeves are subtle, but edgy and the flare is just right on the jeans as well. I’m glad I never gave away those flared jeans from years ago, haha! Perfect outfit Miranda!! Your legs look incredibly long with those flares!! They totally suits you, Miranda! Actually you would look great in anything! Looking fierce with the sunnies! Happy Monday! I wore flared jeans around three years ago and then suddenly it was gone! So glad you’re rocking these! This outfit is so ridiculously crisp! I love those dark stained bellbottom jeans with the loose top!